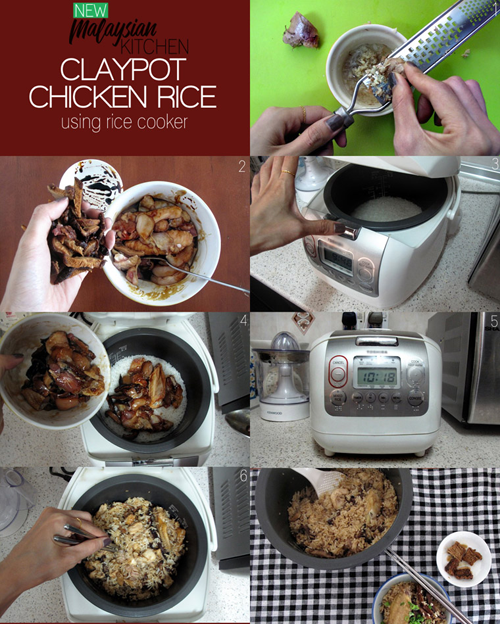 Claypot chicken rice is one of Malaysian’s favourite dish and can be easily made at home. There are many variation of it. My favourite version is in my ‘One Pot Wonders’ cookbook which includes flavourful ingredients like salted fish, sesame oil, pepper and belacan chili. Instead of a rice cooker, I made it in Philips All-in-one cooker, or an ‘instapot’. But when I first started cooking, I have very little kitchen appliances and just wanted to make this dish with the bare minimum ingredient. To find out the simplest way to make this recipe, I compared my family’s recipe and a few from the Internet such as Noobcook’s. With all the information I gathered, I remove ingredients that I believe is not necessary such as lap cheung (chinese sausage) or salted fish. All I wanted then is a quick, fuss-free and filling dinner. You don’t need a claypot, but you do need a rice cooker and a grater. The preparation time is fast (10 min of rinsing rice, chopping chicken, pouring sauces and slicing mushroom). Then let the rice cooker do its work and wait for about 35 minutes for your one-dish meal. You probably have most of the ingredients you need at home. If you don’t normally cook and have very little seasonings in your home, you should like this one. Step 1 PREP: Rinse and pat dry chicken. 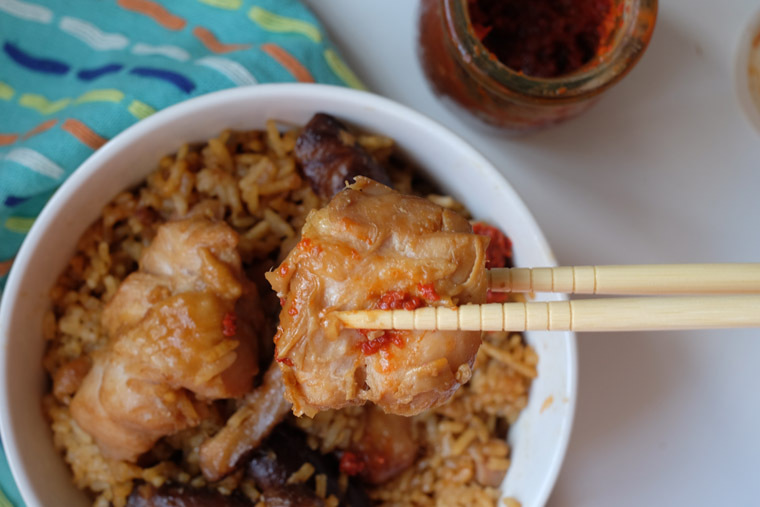 Chop chicken into bite-size pieces (5 cm x 5 cm) and place in a large bowl. Rinse rice. Soak mushroom in water until soften, then slice thinly. Step 2 MARINATE: Pour dark soy sauce, light soy sauce and oyster sauce into the bowl of chicken. Grate ginger into it. Mix well. Set aside. Step 3 COOK IN RICE COOKER: Add 2 cups of rice and 2 cups of water into the rice cooker. Set to cook. 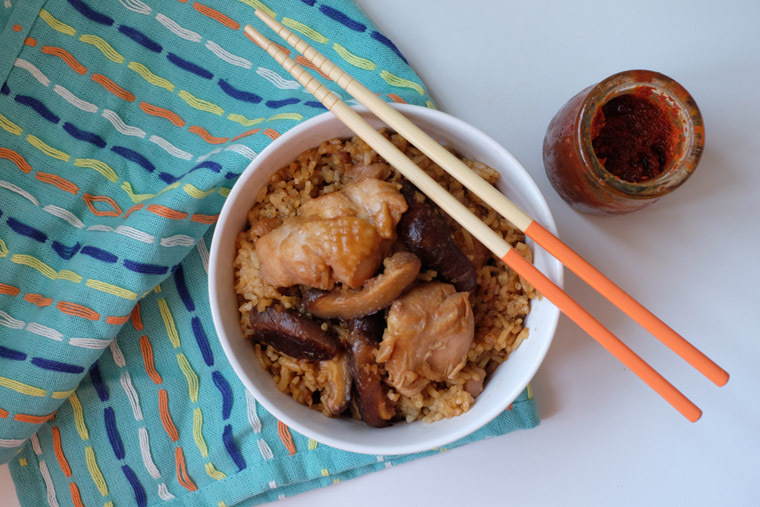 Step 4 ADD CHICKEN & MUSHROOM: After 20 – 25 min, or when the rice solidify but still cooking, add marinated chicken along with the sauce and sliced mushroom. 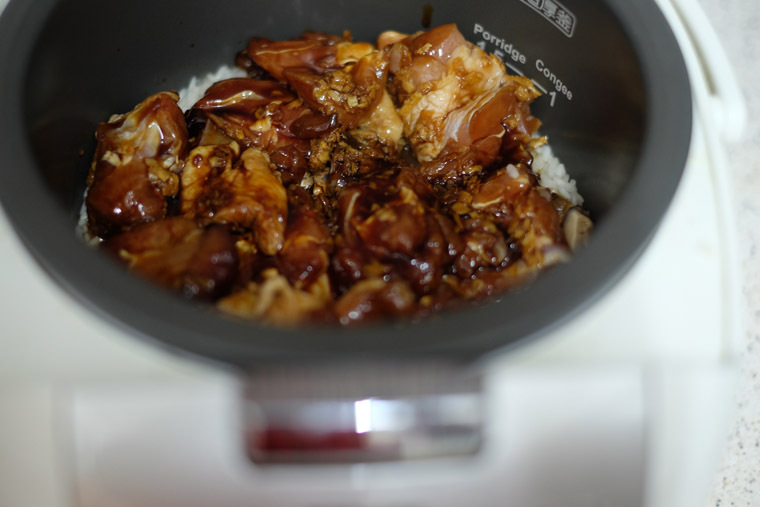 Close the rice cooker lid and continue cooking for at least 15 – 20 minutes. You may want to let it “keep warm” for a while to ensure that the meat is thoroughly cooked. 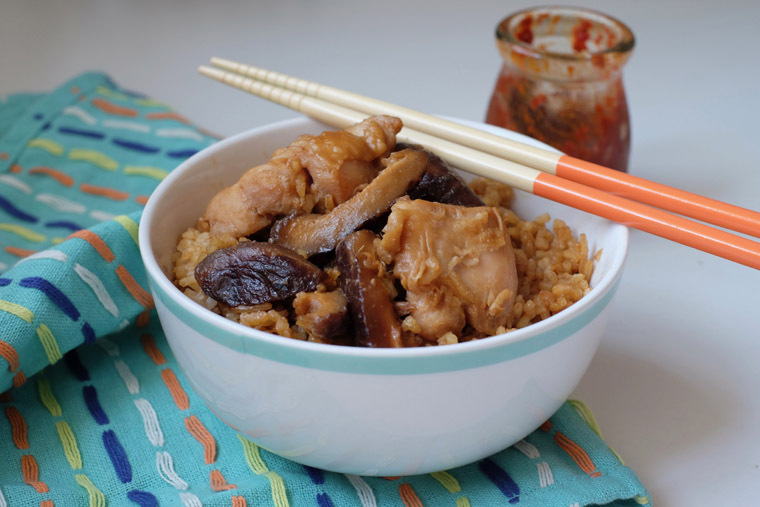 Step 5 SERVE: With a chopstick, mix the chicken, mushroom and rice together. The rice will turn brown from the soy marinade. Best serve with chopped spring onions, salted fish and belacan chili. 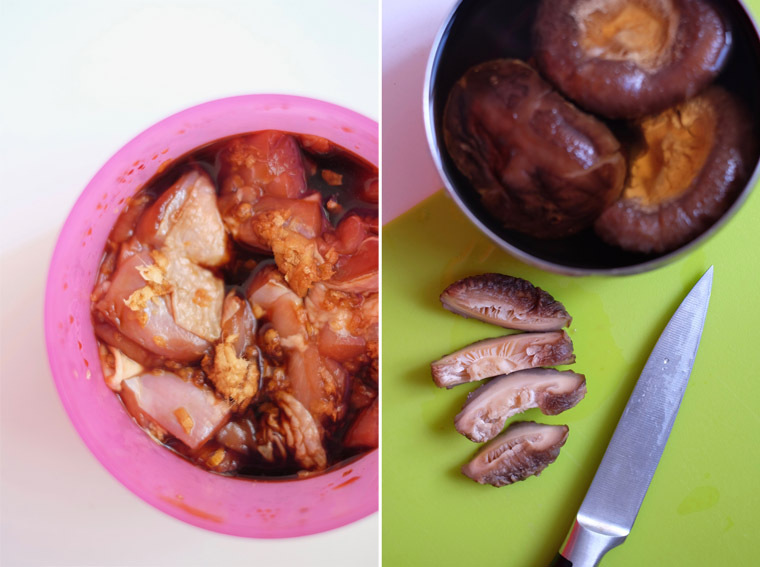 Marinate 600 g chopped chicken thigh & 4 sliced mushroom in 1 tbsp dark soy sauce + 2 tbsp of oyster sauce + 4 tbsp light soy sauce + grated 2 inches ginger . Cook 2 cups of rice + 2 cups of water in rice cooker. After 25 min add in marinated chicken, sauce & mushroom. Let it cook for 15 min. Best serve with chopped spring onions, salted fish and belacan chili. When I first made this dish, I used chopped chicken with parts like thigh and drumsticks as that was what I had in hand. However, its’s best to use chicken thigh and chopped it into smaller pieces. It’s not only easier, but cooks more evenly. I also made ginger juice. In this even simpler recipe, I grate ginger directly into marinated chicken. Note that a metric ‘cup’ is 250 ml. However, your rice cooker comes with a ‘rice cup’ that is about 160 ml. Do measure the rice using the cup that comes along with your rice cooker. But whichever cup you use, as long as you stick to 1:1 ratio of rice to water, you’ll be fine. If you can, marinate the chicken for a longer time so that it has more flavour. I normally plan my meals ahead and marinate it the night before. It’s ok if you can’t marinate it for long. You’ll get good flavour from the soy, salted fish and belacan chili. As dried shiitake mushroom takes a while to soften when soak, you can considered freezing soaked and sliced mushrooms. When I am in a rush, I soak it in hot water and slice it with a sharp knife. You could also soak it overnight. Do not discard the water used to soak mushroom as in contains good umami flavour. Use it to cook the rice. If you don’t have a grater, you can julienned or slice the ginger thinly. As every rice cooker is different, the cooking time varies. The timing given above is a rough estimate. To make the dish healthier, add some vegetables such as long beans and garnish with spring onions. I love pairing this dish with fried salted fish and belacan chili dip! If you’re eating it without condiments and normally prefer your dishes a bit salty, you may need to add a little bit more soy sauce for more intense flavour.